So... as an entry level droid, it does make more sense (to me) that it might not have all the bells and whistles, so adding the optional upgrades helps to "suspend disbelief." As for the litter, I imagined the droid having a sort of fork lift function that would allow the droid to carry the litter perpendicular to its body (either across its body or "forward" oriented, sepending on space available). If that changes your perspective, perhaps it would still fit into your concept. But even if not, the availability of higher trim levels makes up for the absence on the base model. The campaign I'm planning is a solo campaign for one player with the possibility of occasional other players. It will be tramp-to-rebel campaign so the main NPC will be the ship captain, and the captain has a little lifting to carry the PC when he inevitably gets knocked unconscious/incapacitated. The ship would definitely need a medical droid for when they come back wounded, so I thought they could be bacta dealers to justify having the droid and a bacta tank on their ship. I imagine that elastic air-balloons of some kind can pop out of its arms and rapidly inflate as cushions for injured bodies so pointy metal stuff is not aggravating wounds. I love the upper body appearance of this droid but the skirt has got to go. Does anyone have any suggestions for some droid art I could use to photoshop the lower body onto this droid. To match the upper body it can't be from skinny-bodied droids. And although this concept art looks like a version of 2-1B designed for a human actor to wear like Threepio, I don't want to use the commonly used Threepio-style lower body because Threepio can't run well and I don't want the droid to appear slow or frail. There are a lot of variations on a casualty-drag sled. They can be operated by one person, preferably a strong one, over all kinds of rough terrain because the material is made of very low-friction stuff. Put a repulsor system on it and you are golden, albeit probably a bit more cost than the Empire would care to put into casualty evac. But of course there's no reason that it would have to be incorporated into the droid rather than just have something like that as an additional piece of kit. Hmmm... what if the skirt was scaled back to a cape fastened at the hips... that could be turned into a stretcher or drag sled? Stiffen the sides, and it's either a drag sled, or, with aid, a stretcher? I'm suddenly picturing a crossover of the Baymax inflatable medical robot from Big Hero Six. Didn't shootingwomprats do stats for that a while back? My mistake: it was Leon the Lion. For utility you probably want either legs or repulsorlift. The legs on the LE Repair Droid (Cynabar's) might fit well. The repulsorlift from the ZQ Infantry Droid looks good too. The repulsorlift droid doesn't seem as feasible for a strong droid that will lift unconscious wounded from the battlefield and carry them somewhere. So a "feet on the ground" droid seems more plausible for that to me. Thanks, Pel! I poured over all the droid images I could find and must have skipped over the LE image for consideration, but seeing it here makes me think differently. I might play with it a bit but this is a good start when I was just stymied. Thank you very much!!! On pg. 55 of Cynabar's Fantastic Droids, there is a Medevac Droid specifically designed to recover casualties from a battlefield and transport them to a field hospital or aid station. That might pair well with a basic medical droid. 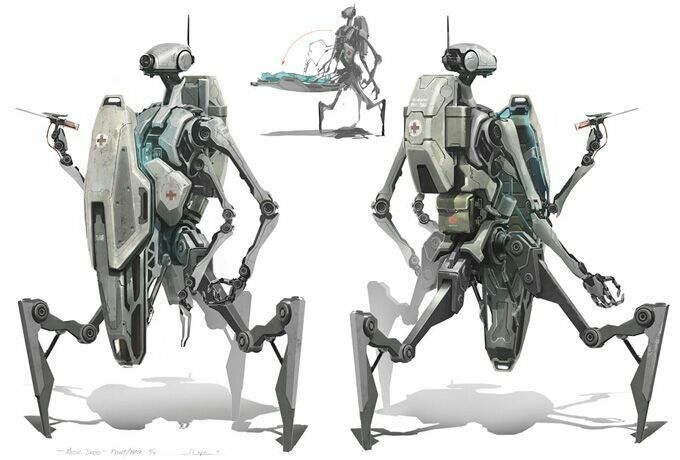 There's also a Droideka-looking droid with a built-in stretcher, made for some online Star Wars campaign. With a patient on board how does that thing not tip over? Neat concept, though.